Ear pain in most cases comes from either the outer ear or middle ear. SWIMMER’S EAR (External Otitis): Is very painful and occurs when the ear canal becomes wet. Bacteria and fungus love the warm, wet, and dark environment, and can multiply causing infection and swelling. Treatment can involve antibiotic ear drops, antibiotic medications and keeping the ear dry. EAR CANAL TRAUMA: Can occur from scratching the skin lining the ear canal as this skin is extremely thin and sensitive. Most treatment involved simple observation and at times antibiotic ear drops may have to be prescribed. DO NOT PUT ANYTHING SMALLER THAN YOUR ELBOW IN YOUR EAR CANAL. NEURALGIA: Is a term used to describe inflammation of the nerves around the ear causing a pain that feels like a jabbing or stabbing inside the ear. 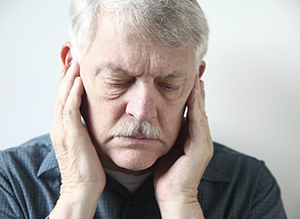 One of the most common causes of ear neuralgia is TMJ. TMJ: Refers to inflammation involving the “jaw joint”. Because this joint lies just below the ear canal, pain from this joint can be referred to the ear via nerves that are “shared” by both areas. TUMORS: Are very uncommon cases of pain of the outer ear. REFERRED PAIN: Due to shared nerve supply, rarely a throat condition, but can cause ear pain. OTITIS MEDIA: Refers to infections of the middle ear. This can often occur after an upper respiratory tract infection that reaches the middle ear via the Eustachian tube. This is most commonly treated with oral antibiotics. CHOLESTEATOMA: Is a benign skin tumor that can grow within the middle ear space and cause infection, drainage, and ear pain. This needs to be treated surgically.